Yes, that is me in a pigpen. Say hello to this new litter of pigs That are about 4 weeks old today. These cute little piglets are a cross breed of heritage Tamworth and Gloucester shire Old Spot and they currently reside at the FarmInstitute on Martha's Vineyard.They truly are enjoying the privileged life! These pigs have been bred over the years to produce a cut of meat with a higher fat content and a larger percentage of dark meat, which in turn yields a taste that most of us have never experienced, REAL PORK. As a competition BBQ team we use heritage pork butts at every contest. 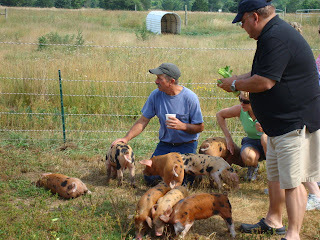 Depending on the market we use either Coleman Farms Hampshire or Vande Rose Farms Duroc. It is our experience and opinion that these heritage breeds provide such a distinct flavor that our constant placing in the top five is a direct result of using only heritage pork. For a taste of real pork, stop by one of our contests and we will be glad to let you sample some, and don't worry, these guys wont be ready until at least November!